Mumbai: India moved a step closer towards becoming a cashless economy with the launch of National Payments Corporation of India’s (NPCI’s) unified payment interface (UPI) on Monday. UPI, which is expected to make e-commerce transactions easier, will also facilitate micropayments and person-to-person payments. The system will allow customers to instantaneously transfer funds across different banks with the use of a single identifier which will act as a virtual address and eliminate the need to exchange sensitive information such as bank account numbers during a financial transaction. As a start, 19 banks have partnered with NPCI, an umbrella organization for all retail payments systems, to offer services based on UPI. UPI is one of many innovations taking place in the financial sector that will benefit the customer, said Reserve Bank of India governor Raghuram Rajan. The introduction of UPI, in particular, is expected to have a significant impact on the ease of retail payments at a time when mobile banking is picking up. In the September-December quarter, the value of mobile banking transactions surged 82% over the same period the previous year. “There is collaboration in this revolution but there is also immense competition and the winner is the customer. We hope customer experience with developments like today’s improves tremendously and the ease of making payments, the ease of saving and the ease for buying financial products also improves tremendously," said Rajan. Rajan added that the improved payment infrastructure along with the launch of differentiated banking models such as payment banks are part of a “revolution" in Indian banking. “What we have in India is the most sophisticated public payments infrastructure in the world. (But) It is not just the payments that are part of the revolution; it is a whole new set of banks that are coming in," Rajan said at the launch of UPI. The central bank granted in-principle approval to 11 payments banks and 10 small finance banks last year. Payment banks will provide basic savings, deposit, payment and remittance services to people without access to the formal banking system. They will not be in the business of lending. The small finance banks will offer basic banking services, accepting deposits and lending to unserved and underserved sections including small business units, small and marginal farmers, micro and small industries and entities in the unorganized sector. The new banks and the initiatives of older private and state-owned banks have led to the revolution, Rajan said. NPCI has been working on UPI since February 2015 under the guidance of Nandan Nilekani, co-founder of Infosys Ltd and former chairman of the Unique Identification Authority of India. The new interface is built on the same infrastructure as the Immediate Payment Service (IMPS), which is currently used by banks for real-time transfer of cash. Though the transaction limit for IMPS is ₹ 2 lakh per transaction, for UPI the limit has been set at ₹ 1 lakh . “Payments have evolved in different ways. You had a card system, mobile money, Internet e-wallets. But completely mobile interoperable person-to-person instant real time with push and pull really didn’t exist anywhere. So I think that is where this is a leapfrog," Nilekani said at the launch. Nilekani added that UPI takes the IMPS platform—on which about ₹ 2.4 trillion of transactions are conducted annually—a step further. “IMPS did not have an easy debit capability. That is being addressed by this platform," said Nilekani, adding that just as IMPS had scaled up quickly over the last five years and has nearly 50% share of the remittance market, UPI will soon become an important payment platform for all merchants. With the platform going live, the onus now shifts to banks to market and communicate the benefits of using UPI to their customers. Over time, bankers see applications based on UPI becoming the norm. “It is going to make small value payments more electronic. I think what UPI can do is bring next innovation such as e-payments on delivery," said Chanda Kochhar, managing director and chief executive officer (CEO) of ICICI Bank Ltd. “I see this becoming really a preferred option for payment for both customers and the merchants." The real benefit of UPI will be in digitizing last-mile payments, said Sachin Bansal, co-founder, Flipkart. “In a lot of ways, cash on delivery and wallets exists in the interim until we find the final version (of payments). We are hoping that UPI will solve the last-mile final gap and make our experience for users a magical one," Bansal said. Earlier this month, Flipkart acquired PhonePe Internet Pvt. Ltd, which is working on a UPI-based payments solution. “PhonePe’s mission is to significantly improve the online and offline digital payments experience for millions of Indian customers. We are really excited to merge with Flipkart and get access to one of the largest consumer bases in the country, which will allow us to realize our vision at a much larger scale," PhonePe CEO Sameer Nigam said on 1 April, when Flipkart announced it will buy the company. “Payments has been one of the biggest hurdles for mass adoption of online shopping in India. UPI has the potential of transforming the entire payments ecosystem in the country," Flipkart CEO Binny Bansal said on 1 April. Shikha Sharma, managing director and CEO, Axis Bank Ltd, considers UPI the WhatsApp moment for payments in India. “Just as Aadhaar has become the base for a lot of policy reform, I think UPI has the potential to dramatically change the payments landscape. The fact that you have a low-cost acquiring solution which is safe can dramatically propagate merchant acquiring across the country," Sharma said. 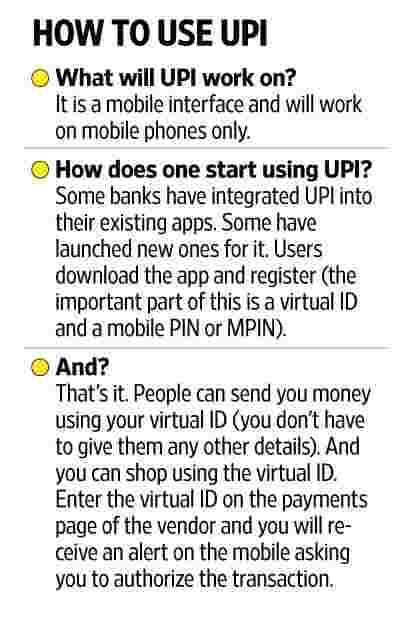 The impact of UPI on electronic wallets is to be seen. Some people say it could mean the end for wallets—a transitory step between traditional payments mechanisms and a full-fledged digital one such as UPI—while others say it will simply make it easier to own and operate wallets. Rajan sounded a note of caution as well and asked banking entities to improve grievance redressal systems and use technologies such as UPI to expand access to formal financial channels. “Somewhere along this chain, a transaction may go wrong. We hope that happens rarely, but it could go wrong," he warned, adding that NPCI should now work towards protecting the system from security breaches and fraudulent transactions. Apart from this, the focus should also be towards bringing in those outside the payments universe and those without smartphones, added Rajan. Mihir Dalal in Bengaluru contributed to this story.